Stocks had a bumpy first quarter, but most investment strategists surveyed by CNNMoney remain bullish. Wall Street professionals are still optimistic about stocks, despite a very volatile start for the markets this year. The 26 investment strategists surveyed in the past week by CNNMoney have an average year-end target for the S&P 500 of 1,968. That would work out to a 6.5% gain for the year and is slightly higher than what experts in our exclusive survey predicted back in January. Of course, this still pales in comparison to last year's gain of nearly 30% for the benchmark index. But the bullish outlook is somewhat surprising considering the market's turbulence. The S&P 500 and Dow took a tumble in January, before clawing back to all-time highs last week. Profits still improving: Most strategists expect the economy to regain momentum in the spring after cold weather put a damper on growth in the first quarter. That should bode well for corporate profits, and therefore stock prices. "Companies remain well-positioned to convert modest revenue growth into solid earnings growth, just as they've done for several years," said Kate Warne, a market strategist with Edward Jones. She expects the S&P 500 to end at 1,985 this year. U.S. stocks could also rise as more investors pull money out of overseas markets, said Jack Rivkin, chief investment officer at Altergis. "When you look around the world, the U.S. looks pretty attractive," he said. Don't fight the Fed: The Federal Reserve's stimulus policies should help support the market as well. Most strategists don't expect the Fed to raise interest rates until the middle of 2015. The combination of low interest rates and improving economic data has helped fuel the latter stages of what is now a five-year old bull market. Kristina Hooper, a market strategist at Allianz Global Markets, said she thinks that once the Fed does begin to raise rates later in 2015, it will do so slowly. But with the Fed likely to pull back further on its bond buying program, most strategists feel that longer-term bond rates will creep higher as investors anticipate next year's rate hikes. On average, strategists expect the 10-year Treasury yield to end the year at 3.25%, up from about 2.7% currently. Stocks too frothy? While most of the strategists we surveyed expect the market to move higher, there are some experts who think stocks may now be overvalued. The market skeptics are concerned that earnings may fall short of expectations given tepid revenue growth and record high profit margins. 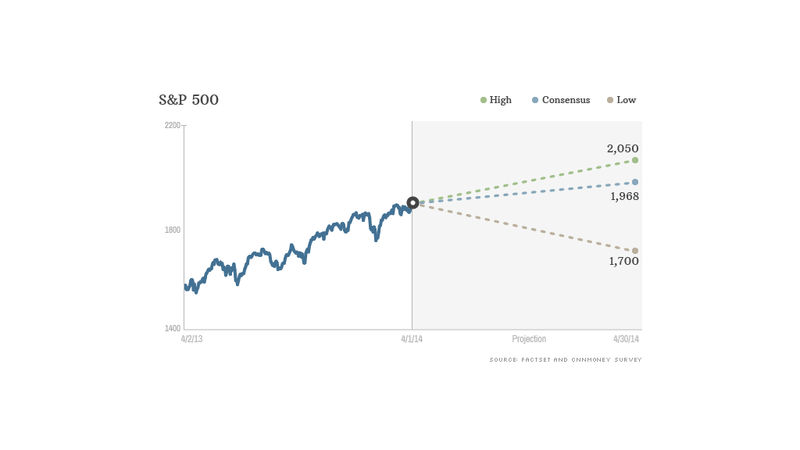 The S&P 500 is currently trading at "levels that would indicate low single digit returns in the coming years," said Jeff Weinger, an investment strategist at BMO Global Asset Management, who has a year-end target of 1,850 for the S&P 500. Specifically, Weinger said "growth stocks" are overpriced, though he sees "compelling deals" in emerging markets. Techs are hot, utilities are not: Strategists felt that the best performing sector of the market this year should be technology. That's because cash-rich companies should begin to increase their capital spending on technology as they upgrade outdated systems. By contrast, the utilities sector is expected to be the worst performer. Utilities tend to benefit when investors are scared and drawn to the healthy dividends those companies pay. Although that wasn't the case on Friday. The Dow Jones Utilities Average (DJU) was one of the few bright spots on a day when the Nasdaq plunged 2.6%. Still, investors may shun slow and steady companies like utilities in favor of tech and other cyclical sectors as long as the economy and earnings gain more momentum. Plus, rising interest rates should weigh on utilities as investors will have better opportunities to earn more income from bonds.